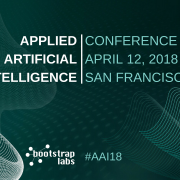 BootstrapLabs is pleased to announce the return of the Applied Artificial Intelligence Conference in San Francisco on May 11, 2017. 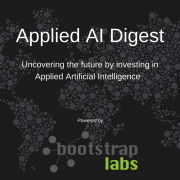 After the incredible success of last year’s Applied AI Conference, we have expanded into a new venue and this year’s conference will be 2x bigger. There are only a few tickets left – don’t miss out – register now at this link. 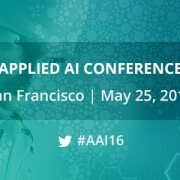 This year’s conference is focused on practical applications and the current commercialization of AI technologies across industries such as Transportation & Logistics, Internet of Things (IoT), Future of Work (FoW), Financial Technologies (FinTech), Cybersecurity, and Healthcare Technologies (HealthTech). Full speakers list at this link.